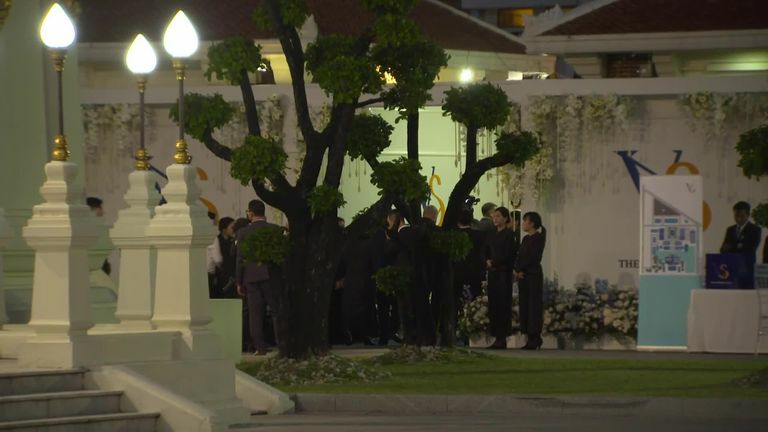 Leicester's squad have arrived back in England after attending the funeral of club owner Vichai Srivaddhanaprabha in Bangkok. Srivaddhanaprabha, 60, was among five people killed when his helicopter crashed moments after taking off from the King Power Stadium following the match against West Ham on October 27. The chairman was a hugely popular figure at the club and a large Leicester delegation including players and coaching staff travelled to Thailand for his funeral, which began on Saturday. In total, 18 players attended part of the week-long ceremony at Wat Thepsirin temple, including Kasper Schmeichel, who witnessed the crashed outside the King Power Stadium. The delegation arrived back in England on Tuesday morning. Leicester next face Burnley on Saturday in their first match at the King Power Stadium since the crash. The LCFC Foxes Foundation, which supports Leicestershire-based causes and builds relationships in the local community, has been renamed The Vichai Srivaddhanaprabha Foundation in honour of the club's owner. The club say the foundation "will continue to build on that life-changing work in a way that reflects the generosity, care and love of a man who made over £4m in personal donations to the city's universities, hospitals and charities in recent years".